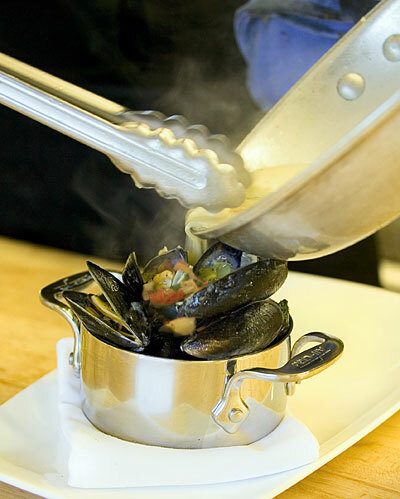 PEI blue mussels grow naturally in nutrient-rich waters and are self-sustained with no feed or additives. Using the long line system, the farming process consists of naturally collected mussel seeds being placed in mesh sleeves suspended in the water column. From the spring until fall, PEI mussel farmers harvest the bivalves by simply lifting the long line from the water. In the winter, however, it’s not as straightforward. I’ve spent a lot of time on PEI and know firsthand how cruel the winters can be. Facing sub-zero temperatures, the farmers head out looking like an arctic caravan, bundled up and wearing polarized glasses to protect their eyes. They rely on GPS to lead them to brightly colored poles in the ice that mark the mussel farm underneath. Sometimes a mile offshore, the ice is four feet deep and disorientation is common in the all white environment of the snow-covered ocean. After drilling a hole with an ice auger, a diver enters the frigid water and removes the mussels with a winch. With wind-burned skin and numb fingers, the crew transfer the mussels to a processing plant where they are cleaned and packaged for market.